I have to agree with someone, I disremember who, that said Adam was making a joyous exclamation that could be heard with the excited voice when a guy says, "Allll RIIIIGHT!" Personally, I expect Eve was a hot babe. 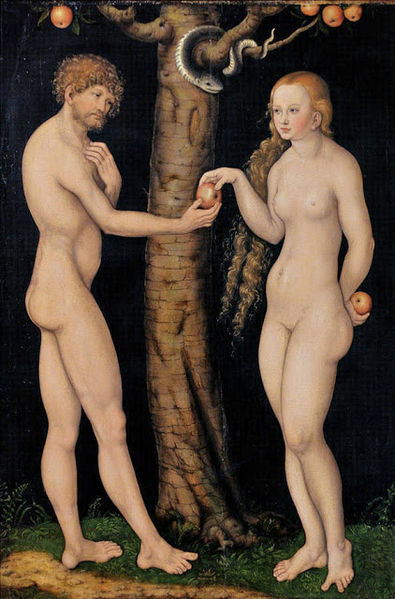 In fact, the first couple were probably the best looking folks in history — despite their depictions in classic art. 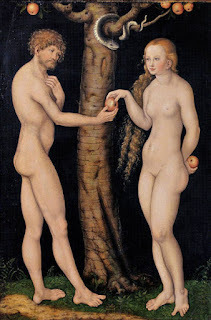 We know what happened in the third chapter of Genesis: the serpent deceived Eve by appealing to her pride (a strategy he successfully uses with humanity even today), she gave the fruit to Adam who probably watch the whole deception thing happening, death entered the world through sin. That's one legacy of Eve. Another is that Adam named his wife Eve because she would be the mother of all people (Gen. 3:20-21). So, people may be tempted to think of Eve as a wicked woman that cause everyone a great deal of grief, and causing women to have increased pain in childbirth (Gen. 3:16). Easy to think negative things, especially when we don't read the text carefully. The Redeemer would come through her seed. Don't just stop in Genesis 3, either, since Eve shows hope and faith. The first woman carried a lot on her shoulders—by encouraging her husband to rebel against God, she helped bring suffering and ruin upon her children and all their descendants. Yet she found hope in the same promised Seed that we all look to. I’ve always been intrigued by Eve. She was the original “bad girl” of the Bible, and most people think of her legacy as one of sin and despair for all mankind. She has another legacy, however, one of hope in her Seed, the Jewish Messiah, Jesus Christ. Understanding Eve and how God worked in and through her gives us hope and teaches us the importance of looking to Christ. To finish reading, click on "Eve’s Legacy—Hope Amid Despair".